Air Mauritius is the National Carrier of the Republic of Mauritius. It currently operates a fleet of six A340-300, two A330-200, two A319-100 and two ATR72-500. 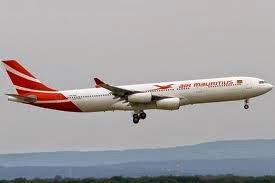 Air Mauritius presently flies to 20 destinations in Europe, Asia, Australia, Africa and the Indian Ocean. Applicants who have applied previously need to apply again and submit an updated application form and CV. 4500 flying hours on multi engine commercial air transport aircraft including 1000 flying hours as PIC on ATR or equivalent. An attractive remuneration package will be offered to the selected candidates. If you are interested, you can also email your cv/resume to mkpilotrecruit_E14@airmauritius.com with your email title as " Application for the position of ATR Captain or A319/330/340 First Officer via flygosh.com "